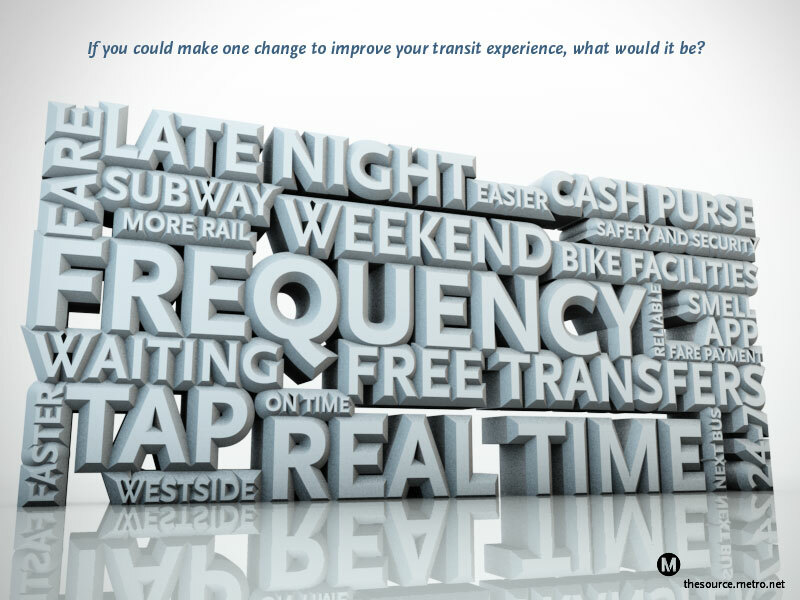 While readers expressed a multitude of opinions, a few ideas popped up again and again: more frequent service, expanded late night service, free transfers, access to real time arrival information and an improved TAP card with stored-value. The good news is that a few of these issues are actively being addressed – TAP cards are moving towards full stored-value implementation and Next Bus is on its way (stay tuned for an update). Not quite as pressing, but worth mentioning: a few riders would like a better smelling ride more than anything else. Read the surveys, after the jump. Errands, the gym, family, social engagements. Red Line, 26.51.52, 14, Gold Line. Car free by choice, Metro is a good option for many of my needs. Yes. It is too expensive to have a car. I walk to work and most all my daily needs. More frequent bus service and real time mobile arrival information. Raise taxes and solve the “limited funds” problem. Then build more rail and bus lines. It’s gotten better. I have been riding since I moved to Los Angeles in 1999. There is better bus service and more rail lines than when I moved here. By improving the system such that is is slower to use a car versus transit. 2-3 times per week for work, and 1-2 times per week for play. From USC to work at the Hollywood Bowl. The 754 Vermont Rapid to the Red Line at Wilshire/Vermont. I don’t have any other options, but even if I did, transit makes it so I don’t have to deal with traffic, especially the nightmare that is Bowl traffic. I ride my bicycle occasionally. During the school year, I am car free. When I go back home to the San Fernando Valley during the summer, a car sure beats the low-frequency service in the valley, so I drive. Only one, huh? I would have to go with the cash-purse feature for TAP. Having to get all the way out to Culver City to put money on my TAP card is a real pain. It would be nice if I could do that online, or at a rail station! Oh boy, absolutely more rail. Imagine someday being able to take a trip from USC to the beach, to LAX, to the Sherman Oaks Galleria, to the South Bay Galleria, to West Hollywood, to Claremont, or to Whittier, all by just riding the rails. That would be a great day for our fair city! It’s gotten better. The screens added on the buses have given me important information and a good way to pass the time. Also, the opening of the Eastside Gold Line has given me some new adventures to talk about. I would tell them to give it a try. Check out some of the great destinations along our subway and light-rail lines, and tell me that that’s not a better experience than being stuck in traffic for hours! I drive 5 days a week for work. I drive from Rancho Cucamonga to Santa Monica. Early morning about 1 hour 15 minutes. If the hours are after 5:30am it can take about 2 1/2 hours.Rush hour on the return home is always about 2 hours. I hate it. There has to be a better way. Yes I carpool once a week. I drive because Metro does not come as fare as Rancho Cucamonga and the price is equal to just driving my own vehicle. My hours don’t allow me to take Metrolink and Metro. Metrolink does not have the hours to connect me to Metro in time to start my shift,and there isn’t any transportation available at that time of the morning. Yes , if you are going into any areas that have train services it’s great, however transferring from Metrolink to Metro trains and then to Metro buses is horrible. It would be great if Metro had light rail that came all the way out towards the Inland Empire and it would be great if Metrolink would honor discounts for Metro dependents. Metro has a huge base that they are not tapping into which is causing most individuals to carpool or just drive solo. It’s also not a great experience for individuals coming here from different countries to visit. They are horrible. Metro should start taking the advice of some of their employees on what could increase ridership among working class individuals who see buses as an absolute last alternative. It would be great if Metro could work on a light rail equivalent to other cities, like the Bay Area’s BART or the subway system in New York. Free transfers is an absolute must. What sense does it make for transfers to be available from metro to muni and back, but not between metro services themselves? I frequently connect from the Silver Line bus to the Green Line train, or vice-versa, and having to pay a second fare during the transfers takes extra time, and is highly annoying. Free transfers are going to be very important after the light-rail lines get realigned by the Regional Connector. Today’s single-line ride from Chinatown to Atlantic will become a two-line ride. As it is, one can transfer from the Purple Line to the Red Line (a Wilshire/Normandie to Hollywood/Highland trip) without paying two fares, while in the meantime the trip from Chinatown to Pico/Chick Hearn is THREE fares. I realize this might be solved with a regional fare policy, which is all the greater reason to rip out the turnstiles now while they might have value on the used market, something that is noticeably missing from the above word cloud. How can you expect reasonable Metro service levels if you live all the way out in Rancho Cucamonga? The planning of that city is completely catered to the car; and buses are an afterthought. Ridership is so low there, it doesn’t make fiscal sense unless Foothill Transit wants to pay for more service. Sorry, I think you need to live in the City to really criticize “low Metro service”. You live in Rancho Cucamonga!!! Can’t tell you how much we need NextBus implemented so I look very forward to an update on that. Perhaps call it NextMetro though and do not leave any lines out! Nextbus is the next best thing to increasing frequency which I have to say is something that should be addressed now if possible while we wait for the future projects like Expo, Foothill, and Wilshire to get built and opened.